*“I walked around here earlier and I just seen everybody busy and at work trying to finish up and it was a great feeling,” exclaimed rap mogul Shawn “Jay-Z” Carter as he strolled the magnificent grounds of his latest hit accomplishment with supreme confidence and comfort. “A guy stopped me in the hallway and said, ‘Man this is a great thing for New York City.’ And that’s what the whole thing was about,” stated Jay-Z at the start of his star-studded grand opening party of his swank 40/40 club & restaurant at the brand new Barclays Center in Brooklyn on Thursday night, September 27, 2012. The well-heeled rapstar arrived at the spectacular sports stadium nattily dressed in a tux and bowtie nodding his head at folks vying for his attention to wish him nothing but the best for his new endeavor. The suave entrepreneur exuded a calm “coolness” as he welcomed his family, close friends, celebrity guests and sponsors to the only sit-down restaurant at Barclays Center that he owns with partner Juan Perez. Located on the Barclays Brownstone Suite Level, The 40/40 Club features key materials and design concepts from its newly renovated New York City flagship location, featuring 36 TVs, including eight 80’’ TVs on the outside of the bar soffit, and offers sweeping views of the basketball court. The highlight of the 9,000 square-foot restaurant is probably the custom-made amber resin bar top, which is illuminated from within by the glow of ALL THAT MONEY. The design for the space is by SHoP Architects with consultation from designer Jeffrey Beers to ensure a consistent look and feel with the flagship venue. The elaborate launch party which took place one day before the Jiggaman officially christened the multi-billion dollar complex in an eight-night live concert that started Friday, September 28, 2012 attracted luminaries such as Rihanna, J. Cole from Roc Nation, Lyor Cohen, Hot 97’s Angie Martinez, Roots’ drummer ?uestlove, Joe Johnson, Deron Williams of the Nets and prominent government officials including NY police commissioner Ray Kelly who was overheard saying, “WOW, this place rocks while playfully flashing a “diamond” sign — a signature move of rapper Jay-Z. Guests enjoyed their host’s favorite Ace of Spades champagne and the D’usse cognac cocktails that flowed all night long and noshed on a menu of upscale comfort food as they grooved in the sumptuous slick club featuring wide walkways lots of oversized glass walls, plush sofas, stadium layered seating, and smooth edges to all table settings. It’s quite an accomplishment for a rapper who grew up as Shawn Carter two miles away and became an entertainer and entrepreneur with a $2 million stake in the arena, according to Forbes. “I am so excited that one of Brooklyn’s greatest gifts to music is opening the new arena in his hometown,” Brooklyn Borough President Marty Markowitz gushed yesterday. The Barclays Center boasts 101 luxury suites, four bars and lounge destinations, three clubs, and eight retail shops. It will house concerts by Justin Bieber, Lady GaGa, Rihanna, Green Day and Barbra Streisand, and various sport events like college basketball and boxing events. 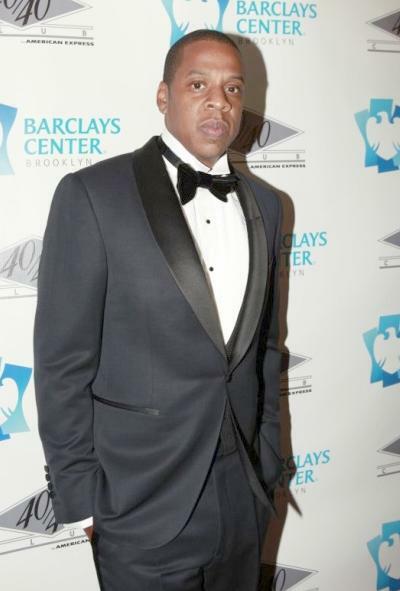 The $1 billion Barclays Center opened with a sold-out concert by the borough’s own Jay-Z. The rap mogul performed for 19,000 screaming fans in a glam-filled coming-out party for the spectacular arena in Prospect Heights. “I have been on many stages all around the world. 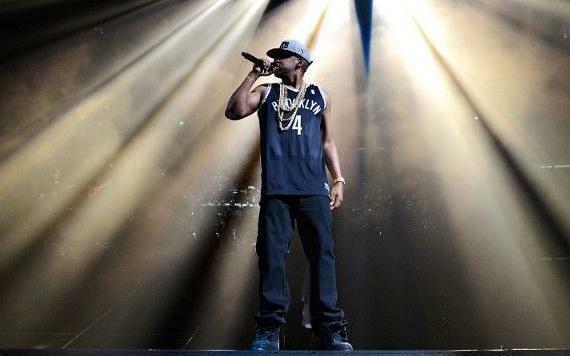 Nothing feels like tonight, Brooklyn, I swear to God!” Jay-Z shouted out as he took the stage wearing a white Brooklyn Nets cap and a black Nets jersey with No. 4 on the back. He opened the show with “Where I’m From” — an ode to his tough upbringing in the Marcy Houses. The audience was excited and wild, cheering on Jay-Z as blue laser lights beamed across the venue. A seven-piece band was placed a level above Jay-Z, who paced from left to right while performing jams like “Empire State of Mind,” ”I Just Wanna Love U (Give It 2 Me),” ”Izzo (H.O.V.A. ),” ”99 Problems” and many others. Videos played on screens behind and above Jay-Z, while screens for fans in the higher sections — though not large enough — showed the rapper’s performance on the left and right sides of the stage. Borough officials were just as excited for the debut of the new venue, the home to the NBA’s Brooklyn Nets. “The opening of the arena truly underscores the renaissance of Downtown Brooklyn,” said Carlo Scissura, the president of the Brooklyn Chamber of Commerce. Barclays Center will be a major sports and entertainment venue in the heart of Brooklyn, New York. Developed by Brooklyn-based real estate developer Forest City Ratner Companies, and designed by the award-winning architectural firms AECOM (www.aecom.com/architecture) and SHoP Architects (www.shoparc.com), Barclays Center will have one of the most intimate seating configurations ever designed into a modern multi-purpose arena, with unparalleled sightlines and first-class amenities. In addition to Barclays, the naming rights partner, Founding Partners for Barclays Center include Calvin Klein, Cushman & Wakefield, EmblemHealth, Foxwoods Resort Casino, MetroPCS, Stolichnaya, and Ticketmaster. Other sponsors include: Anheuser-Busch, The Coca-Cola Company, Haier America, HighPoint Solutions, LIU Brooklyn, New York Marriott at the Brooklyn Bridge, Tyco, and Willis. Located atop one of the largest transportation hubs in New York City, Barclays Center will be accessible by 11 subway lines, the Long Island Rail Road, and 11 bus lines.